An aerial view of the harbour and the town, probably taken between the Wars. Does anyone know the name of the ship in the foreground? My understanding was that the majority of the tanks contained fuel oil while some were designated to hold water so that navy ships could be supplied at the Admiralty Pier. I don't believe that the contents changed due to likely cross-contamination. On 15th February 1941, a Junkers 88 dropped two bombs on the tank farm. One went through tank 13 into the next tank and exploded without causing a fire. The oil from the tanks flowed out onto the railway track and flowed along this westwards to the station. The second bomb went through another tank but failed to explode. The plane then avoided the church spire and shot up a Sunderland flying boat moored in the Firth. The unexploded bomb was defused and the oil was hosed into the Firth. Comments from my father - George Coghill: the big tanks seen in the picture were filled with oil. During the war these tanks were drained and filled with water. As the story goes they were struck by a bomb at one point damaging two or three, releasing the contents which ran through the town to the Harbour. This story was told to my father by person's unknown. Is this a true story..??? - not sure. A variation on the story of the bombing of the tank farm is contained in the excellent book by Marinell Ash entitled 'This Noble Harbour - A History of the Cromarty Firth'. (Copies of the book can be obtained from the Cromarty Firth Port Authority). I quote: "Late on the morning of 17 February 1941 a lone German bomber managed to fly into the Firth under the guns on the Sutors and scored a direct hit on number thirteen tank at Seabank Tank Farm at the back of Invergordon. The bomb exploded inside the tank rupturing its sides. The top of the tank fell down intact. Oil spilled down into the railway cutting and into the sea." There seems to be some doubt as to the precise date, but it is generally agreed that it was tank thirteeen that was destroyed. There is still a gap where it used to exist. Take a look at picture #389 to see the effect of the bombing raid. Is there any truth in the story that there were two men working on top of tank 13 when it was hit? The story goes on to say that the two presumed to be dead were seen later that day in the Caley bar to everyones amazement! Robert - my uncle Gordon Andrews wrote an account of the bombing (including about the two presumed dead men and also the horse...). He told me that he was planning a visit to the museum in the next couple of weeks, so if you spot him, do ask him about it, and we'll try to dig out his account. And isn't it amazing how an expert can date a photo so accurately using information the rest of us wouldn't have an idea about? Now, about the ship. Unquestionably a battleship of the ROYAL SOVEREIGN class - I think HMS REVENGE (actually the first of the class to commission), which from Winter 1917-18 had the upper bridge extended aft until it was very close to the funnel. This remained a distinguishing feature - see drawings in Breyer's 'Battleships and Battlecruisers 1905-70'. The date? Sometime after Spring 1925 (when prominent searchlight towers at the foot of the mainmast were removed, and the aforesaid upper bridge structure enlarged further) but before 1931 (see photo on p170 of Raven and Roberts' 'British Battleships of WW2 - the fore-topmast has been removed to allow siting of a HACS director). In fact the photo may have been taken no later than REVENGE's refit which began January 1928 - during which the HACS director was first fitted (Raven & Roberts p140 - there's also a good photo here of REVENGE in 1926) and the fore-topmast probably removed. So, what am I saying - the summer of 1925, 1926 or 1927. I'll look at Admiralty Movement Records in the library of the RN Museum, Portsmouth. The crude oil from the tank flowed through the station and on to the sea. Oil stains could still be seen on the platform edges, and the cellars under the station were filled with the stuff. The German bomber also strafed the siding that runs along the bottom of Bulls Hill leaving bullet markings on the rails. After this attack the gun positions between the Middle pier and Dockyard pier had at least two layers of bricks removed as the bofors could not be deflected enough to fire at the plane. I have just read the above comments about the bombing of the oil tanks in 1941. I was 11 years old at the time and in the same class as Gordon Andrews. Classes Primary 4 and 5 were "evacuated" daily to Alness School by train where we occupied the classrooms in the morning and they in the afternoon. On the day of the bombs the train could not enter the station and I think we walked home from the Donkey Bridge (not sure). We had 2 or 3 days off school! George, I’m glad that somebody else remembers catching the 9am train from Invergordon to Alness to go to school AM and then catch the 1150 train back home again. The reason for this was that the Navy had taken over the junior school. I think that even with that short school day we still learnt a great deal which says something for our teachers (Miss Munro for one). Thinking about George saying he walked home from the Donkey Bridge, it must have been along Bulls Hill as the road from the railway cottages to past the slaughterhouse would have been covered in oil as it flowed down the line through the station and across the main road into the sea. Does anyone have memories of the flying boat which, after take-off, crashed on to the railway line north of Invergordon about 1942? The battleship in this picture does indeed seem to be one of the Revenge class, completed in the later part of World War I, but which one it's difficult to tell. 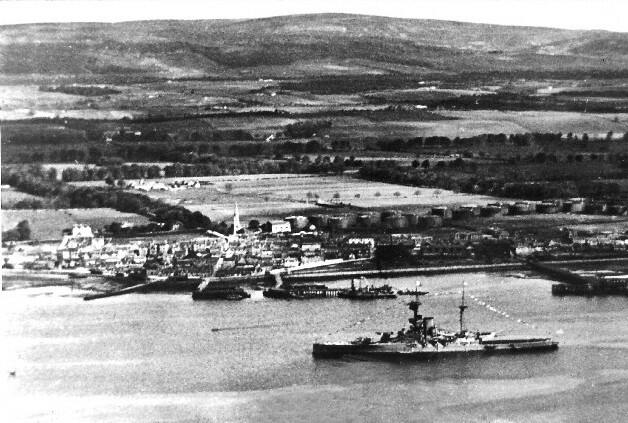 Revenge's sister ships were Ramillies, Resolution, Royal Sovereign and Royal Oak, the last being sunk in Scapa Flow by a U-Boat in 1939. With reference to Bob Drummond's query about the flying boat, I think that happened in late 1944, according to the late Councillor Jim Paterson, who was home on leave from the army and tending his uncle's sheep nearby when he saw the accident. Most of the crew are buried at the local cemetery. I have two photos of HMS Valiant, one of the similar Queen Elizabeth class, at anchor in the Cromarty Firth, taken around 1932 by my late father-in-law Alan Sutherland, at that time a young civil engineer with Ross & Cromarty County Council. I would be very willing to pass them on in Jpeg form. Thanks Willie. Is it Invergordon cemetery where they are buried? Rosskeen Cemetery, Bob. I had to check the OS map for the name, which I ought to have known well enough. I've seen the graves. If (failing) memory serves me correctly, most of the crew were Australian. Thanks again. Must give the cemetery a call some time. Do I understand your photos will be on the website soon? If so I look forward to seeing them.